Mary is responsible for the operations and management of the primary business units related to the Residential Division of NP Dodge. She oversees the day to day activities of E-Commerce, Corporate Relocation and Commissions. With her team, she actively analyzes these operations for both efficiencies and development of new systems and partners to promote growth and success for the brokerage. As a licensed real estate agent, Mary joined NP Dodge in 2005. Later that same year, she became the Client Services Manager where she build best practices for increasing business and leads for NP Dodge sales associates. In 2010 she was promoted to Director of Agent Development and then promoted to Vice President of E-Commerce and Career Development. 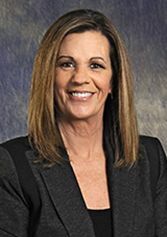 She is a member of the National Association of Realtors, Nebraska Realtors Association, Omaha Area Board of Realtors and Great Plains Multiple Listing Service. Mary was the 2012 thru 2017 Chairperson for the Omaha Area Board of Realtors Diversity Committee and an instructor for the Omaha Area Board of Realtors Orientation Program teaching the Code of Ethics. Mary earned her bachelor’s degree in Communications with a minor in Business from Arizona State University. Prior to joining NP Dodge, Mary worked as a business analyst for First Data Resources.